As July draws to a close, gradual separation in the American League East has begun to emerge. After beginning the month three games behind the Yankees, the Red Sox have turned the tables on their rival by going 16-3 and taking a three game lead of their own. At the other end of the spectrum, the Rays have stumbled to an 8-11 record, which has pushed them 10 games behind in the loss column. Meanwhile, the Yankees have taken the middle road, compiling an 11-9 record that has helped solidify its hold on a playoff slot by two games, despite ceding six games in the standings to the Red Sox. Note: Negative numbers represent games behind; positive numbers represent games ahead. With the trade deadline nearing, all three teams have been involved in rumors regarding impact players. For the Yankees and Red Sox, the whispers have hinted at key acquisitions, like Carlos Beltran and Ubaldo Jimenez, however, for the Rays, most of the “unnamed sources” present the team as a seller. James Shields, B.J. Upton, and Kyle Farnsworth have all been rumored to be available, which, on the surface, seems like a premature white flag. Then again, judging by the strength of the Rays’ farm system, as exemplified by the very early impact of Desmond Jennings and Alex Cobb, Tampa might actually improve its post season chances by shedding veteran players. The current A.L. East trends place the Yankees in a precarious position. If the Rays wind up conceding early, the only realistic competition for a wild card would come from the Angels, who currently trail the Yankees by seven games in the loss column. 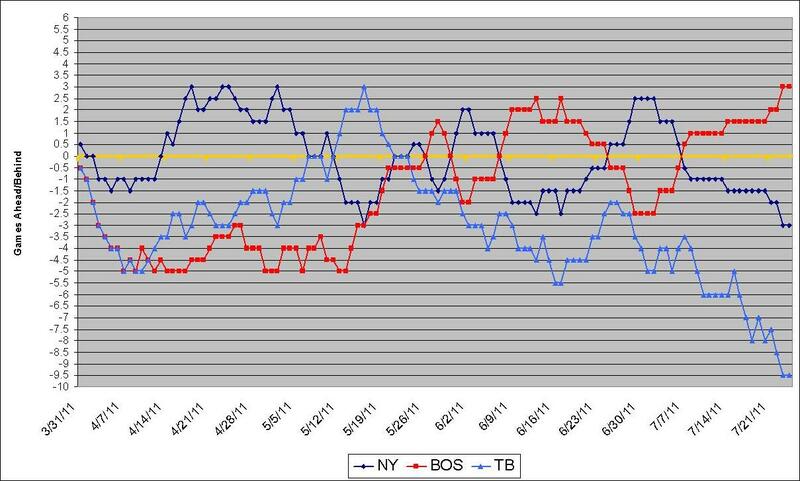 Furthermore, if the Red Sox continue to win at a prolific pace, the Yankees could quickly find themselves far removed from the division lead. The result of these two scenarios would place the Yankees in a pennant race no man’s land. Because of the current structure of baseball’s playoff format, there isn’t much of a distinction between winning the division and settling for the wild card. As the Yankees and Rays proved at the end of the last season, when two teams are assured of playing in October, the pursuit of first place becomes a battle worth losing in an effort to win the World Series. Although most baseball fans seem content with this tradeoff, I find it disconcerting. As I’ve argued many times before, there is something inherently satisfying about finishing first, or more simply, winning for winning’s sake. That is, after all, one of the legacies upon which the Yankee brand has been built, but last year, it was betrayed by the way the team approached the final month of the season. For that reason, I find myself more concerned by the thought of the Yankees playing out the string than the chance they might miss the post season altogether. Not only does the Yankees current position create a dilema from an idealist’s standpoint, but it also makes GM Brian Cashman’s job a little more difficult as well. Considering the relatively week competition on the upcoming schedule, the Yankees could easily have as much as a 10-game hold on the wild card by the time the deadline rolls around. If the Yankees are content in this position, it could lessen Cashman’s urgency to make a trade. However, if the goal is to track down the Red Sox, he might be more aggressive. Ultimately, the objective should be to improve the team in the most sustainable way possible, but when the season objective is murky, it becomes more difficult to weigh the trade-offs involved in a midseason acquisition. Over 60 games remain on the schedule, so a lot can change in the standings. If the Yankees get hot while the Red Sox cool down, Joe Girardi might be able to coast into October the right way…by resting on the laurels of a large division lead. Also, if the Rays and/or Angels stick around in the wild card race, the Yankees would have no choice but “to play to win the game”. Although it’s too early to be preoccupied by either scenario, the sour taste from last year remains, making the thought of another dose of indifference very difficult to swallow.